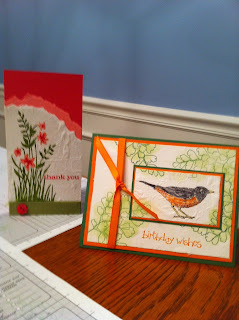 I decided to sign up to be a Stampin Up Demonstrator and share my love of rubber stamping with my friends. It is amazing all the beautiful things you can create with Stampin Up products and how easy it is to do. I look forward to sharing ideas and projects with my friends to get them hooked on this crafting thing like me! I went to a technique class last night and learned how to use tissue paper to make a silk effect on projects. Below is a picture of two of the projects I made. More to come on my new adventure at being a demonstrator. I’ll also add how you can order supplies from me or host a party soon to my blog. WOW! Those are amazingly Gorgeous!